Drag the THM1176 application to your Applications folder. For desktop systems, this software has been superseded. Please see the appropriate download. 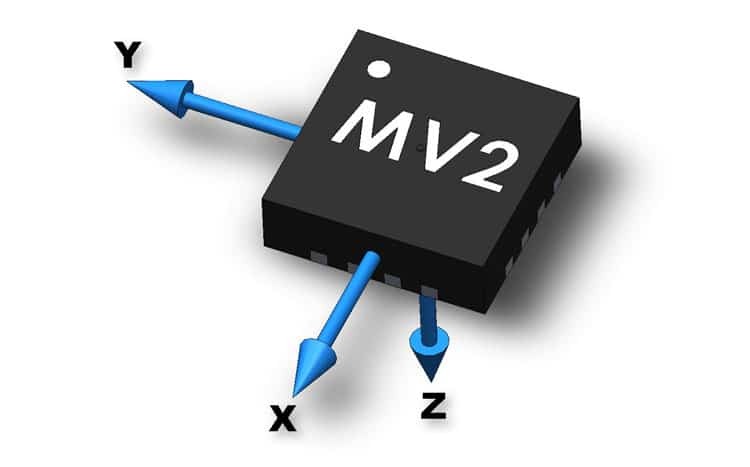 This software requires the THM1176 firmware to be at v3.x or higher. Use Setup panel in the THM1176 software, or the “*IDN?” command, to find the firmware version of your instrument. Consult the PDAReadMe.rtf file for instructions on how to install the THM1176 v4.x software on a Windows Mobile PDA. Be sure to uninstall previous versions using Settings>System>Remove Programs. The Three-axisThe magnetic field is a three-dimensional vector quantity. A single Hall element only measures one component. 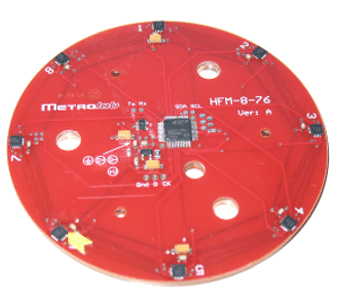 A three-axis Hall instrument has... Fluxgate MagnetometerAn instrument to measure magnetic flux density (B) or magnetic field intensity (H).... TFM1186 is a member of Metrolab's THM1176 family of 3-axis handheld magnetometers. 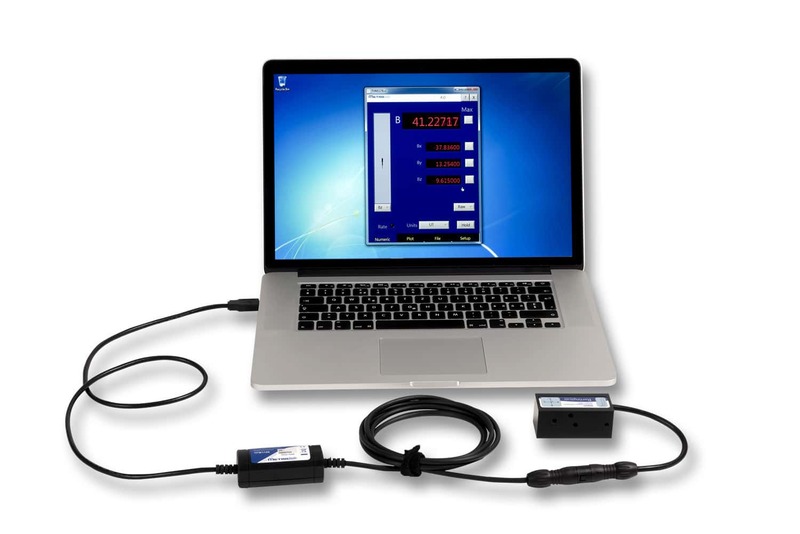 It is a lightweight, low-power, go-anywhere fluxgate magnetometerAn instrument to measure magnetic flux density (B) or magnetic field intensity (H)...., combining a professional instrument with the usability of a consumer USB device. 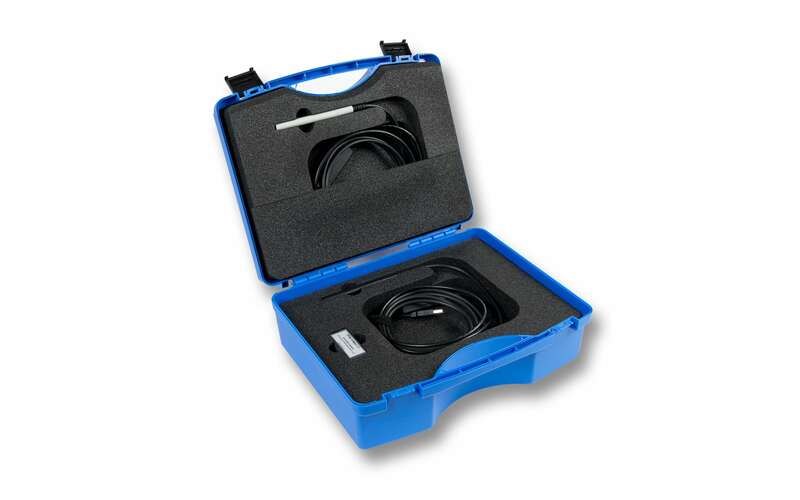 Outstanding noise characteristics make fluxgate magnetometers the instrument of choice for measuring minute disturbances in the local magnetic field, for example due to an iron mass or AC power-line noise. The TFM1186 has a rangeThe range of a probe is defined by the minimum and maximum field strength it can measure. On an instrument,... of ±100 µT and a resolutionResolution measures the ability of a magnetometer to distinguish ("resolve") two nearly identical field values. Related to precision, but not to... of 4 nT. 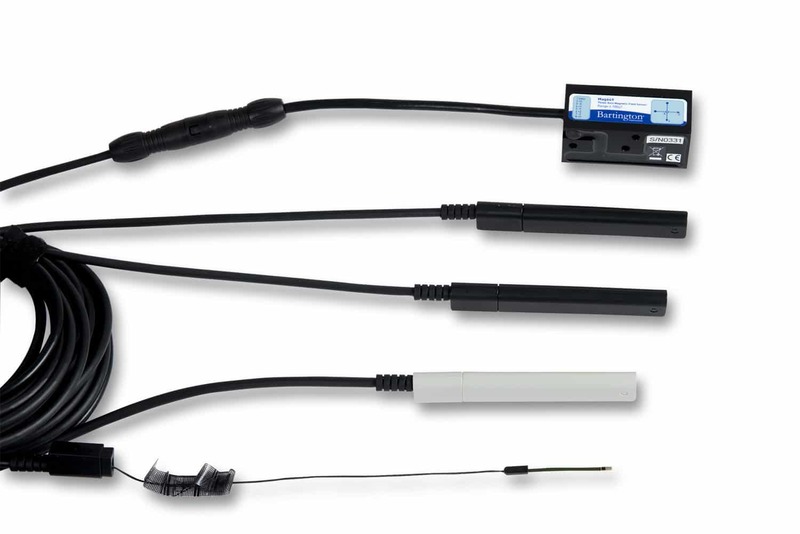 The TFM1186 simultaneously measures all three axes of the magnetic field, so you get a true field strength reading no matter how you hold the probeThe actual sensor that is placed in the magnetic field. The NMR probe contains the NMR sample; the Hall probe.... The entire instrument has been reduced to a cable with a few fat spots, which can plug directly into your PC or into a battery-powered handheld computer. If you just want to plug a magnetometer into the USB port of your computer, you need the Desktop Kit. 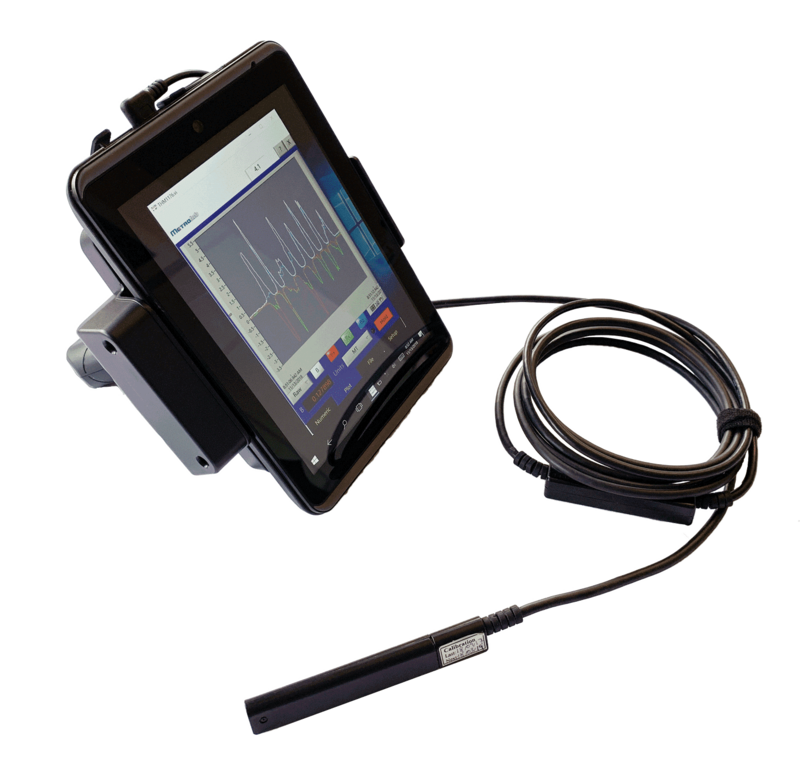 The Handheld Kit, with its optional battery-operated, industrial quality tablet computer, takes the measurement from the lab bench to the field – although of course you can still use the instrument with your computer, too. 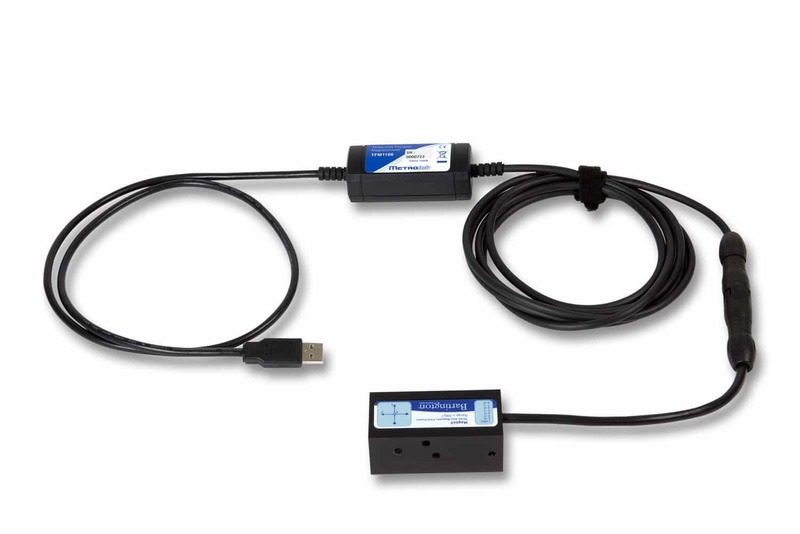 If you also need to measure higher fields, the Duo Kit provides a practical and cost-effective package of any two probes in the THM1176 family, with or without handheld computer. All kits include a CD with the manual, software for Windows and Mac, and all source code. The handheld kits include a carrying case with the tablet, charger, adapters and cables. The computer interface complies with the USB, USBTMC/USB488, DFU, SCPI and VISA standards, and is compatible with Windows, Macintosh and Linux based computers. The supplied software displays the total field and its x, y, z components, while a “3D Compass“ permits direct visualization of the vector direction. FFT, RMS or Peak-to-Peak computations can also be displayed, both numerically and graphically. The user has full control of all measurement parameters, such as sample rate, trigger mode and data averaging. Visual and auditory alarms can be used to signal when measurements are out of bounds. Last but not least, measurements can be recorded to a file, played back in any of the available display modes, or transferred for further analysis using, for example, Excel or Matlab. Attention to detail ensures that you get accurate measurements with a minimum of fuss. Auto ranging automatically selects the range you need, and auto temperature compensation minimizes the effect of temperature fluctuations. Different trigger modes are designed to support signal averaging, AC measurements, or synchronization with external events. Results can be displayed in T, mT, µT, nT, G or mG. The firmware can be upgraded by the user. Even the signal cable between the sensor and the electronics is specially designed to minimize induction effects.